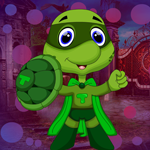 G4K Superhero Tortoise Escape is another point & click escape game developed by Games4King. There were a few houses and palaces on a beautiful gigantic island. A superhero tortoise lived at that place. One day, that superhero tortoise was locked up in a palace by some enemies. It is your duty to rescue the superhero tortoise. It will help you to find the hidden clues in the form of colours and numbers and to find the items where the superhero tortoise is to save the animal. Find them all and solve all puzzles to free the superhero tortoise. Good luck and have fun! Agree with Jef Pedal. Thank you G4K for listening to your players. Nice game, G4K. Thank you for not having difficult sliders or rotators.